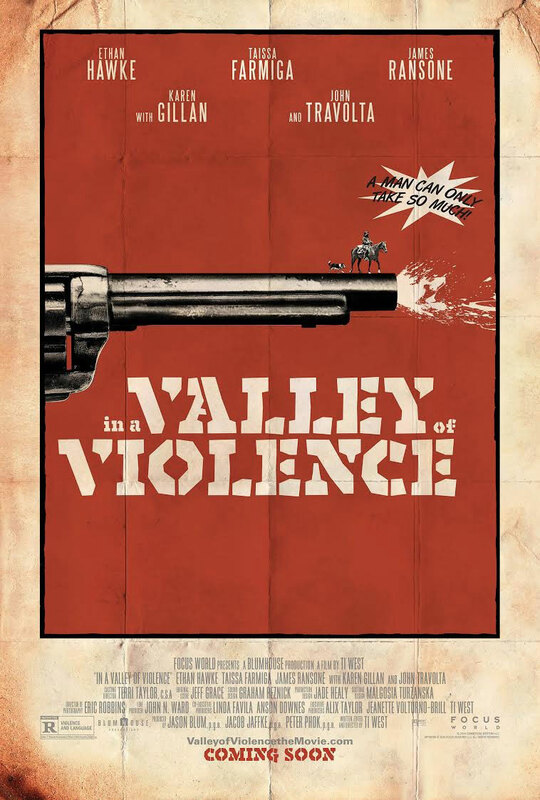 This is a review for the brand new Drama/Western, “In A Valley Of Violence”, Written and Directed by Ti West (The Sacrament and House Of The Devil) *see review* https://adamthemoviegod.com/the-house-of-the-devil-review/. 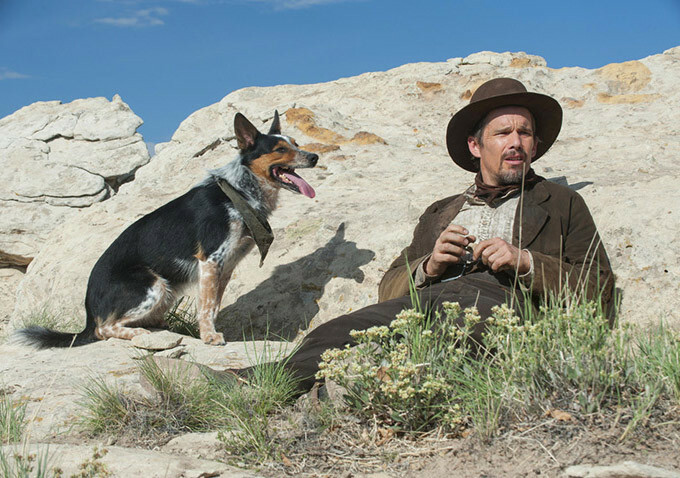 In A Valley Of Violence follows the journey of a mysterious stranger (played by Ethan Hawke) and his dog as they make their way to Mexico. A random act of violence in the small-town of Denton, sees Paul’s (Hawke) fate cross paths with a town of misfits, headed by Gilly (James Ransone) and the Marshal (John Travolta). The film also stars, Taissa Farmiga (of American Horror Story), Larry Fessenden (Carnage Park and We Are Still Here), Karen Gillan (Dr Who) and Burn Gorman (Game Of Thrones). It’s quite rare that Jason Blum and Blumhouse Productions back a film in a genre that isn’t Horror. I’d heard a few things about this one over the last couple of months but it hasn’t had the same publicity as its counterparts in “Jane Got A Gun” and “The Duel”, among some others. I thoroughly enjoyed West’s, House Of The Devil, an homage to old school 80’s Horror, and can always respect film makers that attempt to add further strings to their bow. I love a good Western, although being born in the 80’s, I never experienced the genre at its absolute peak. 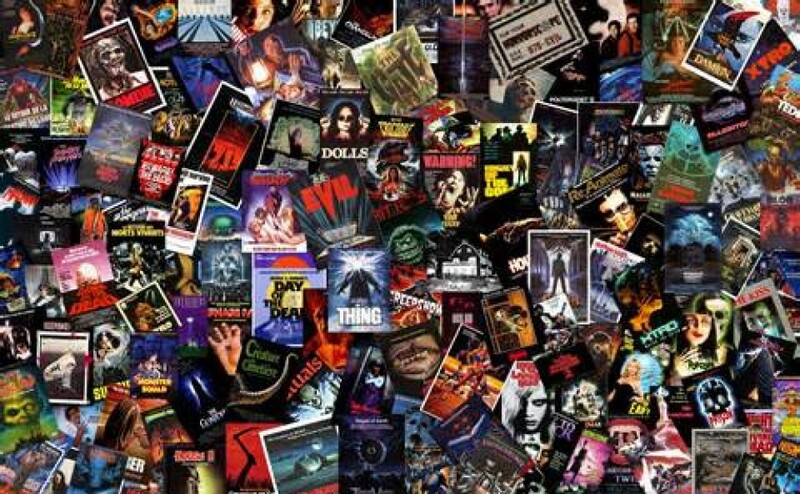 The times when Sergio Leone (The Good The Bad and The Ugly), John Ford (The Man Who Shot Liberty Vance) and Clint Eastwood (High Plains Drifter), along with many other greats, were making some of the classics that fans still know and love today. Over the last few years I’ve managed to get my hands on a selection of old Westerns and quite enjoyed them but the one thing I will say, is that they always feel overly long, given their simplistic stories. Where as if you take a look at modern films like Quentin Tarantino’s, “Django Unchained” or “The Hateful Eight”, you’ve got several more layers that warrant more content. Other westerns in recent years have fallen well short of the desired mark. “Jane Got A Gun” felt extremely muddled and “The Duel”, despite good performances (particularly from Woody Harrelson), was unnecessarily drawn out and I’m really glad that wasn’t the case with West’s latest film. The clever opening title credits, accompanied by a really good musical theme by Jeff Grace, get In A Valley Of Violence off to a catchy start. The shooting style and genre of film lends itself perfectly to great shot choices and stylish cinematography. The color grading is accurate for the time period and that’s an important aspect when making a western. There’s great establishing shots that showcase the barren lands and a nice series of shots that stood out during the bathroom scene in the Denton hotel. Synth and Bass aren’t something you’d associate with westerns but they work surprisingly well here. Ti opts for big orchestral based themes while depicting the drama but his clear love of old school Horror can’t help but peak its way through the mix. Ti West has built a film career through a low-budget, DIY (do it yourself) style of production and to this day, continues to do so. In A Valley Of Violence is much more like an independent film than a studio one, in terms of the amount of money behind it (in comparison to other westerns), yet somehow West was able to bring this well established group of actors/actresses together for his film. I think that’s a true testament to the type of film maker he is and how people see the high quality work he puts out. The cast is led by a wonderful character actor in, Ethan Hawke. I’ve been a fan of Hawke’s for a long time and before I saw the trailer for “The Magnificent Seven” remake (which he also appears in), I never thought he’d do a western and now somehow he’s done two in a year. His portrayal of a man trying to find himself is admirable and although he doesn’t actually find his own voice or walk/strut, something that we’re used to seeing from our heroes of the west, he still grounds himself nicely. All the scenes Paul shares with his dog, Abby, are thoroughly enjoyable and further highlight why we love our four-legged friends so much. In the beginning, Paul crosses paths with a priest (played by Gorman) and as often is the case, things take a turn for the worse. This introduction really helps set the scene and tone of the film and gives you an idea of what sort of individual Paul is. Taissa (the younger sister of Vera Farmiga), gives an energetic and likeable performance as Mary-Anne, co-owner of the hotel in Denton with her sister, Ellen (Karen Gillan). The real surprise here though is the inclusion of John Travolta. Here’s a guy that’s done work in almost every genre, some of it successful, some not but it’s something about this older, more disheveled looking Travolta (which I know is probably mostly makeup), that really suited the role of the “Marshal” perfectly. His lengthy mustache looked authentic and his voice and dialogue delivery was as good as anything he did in his heyday. 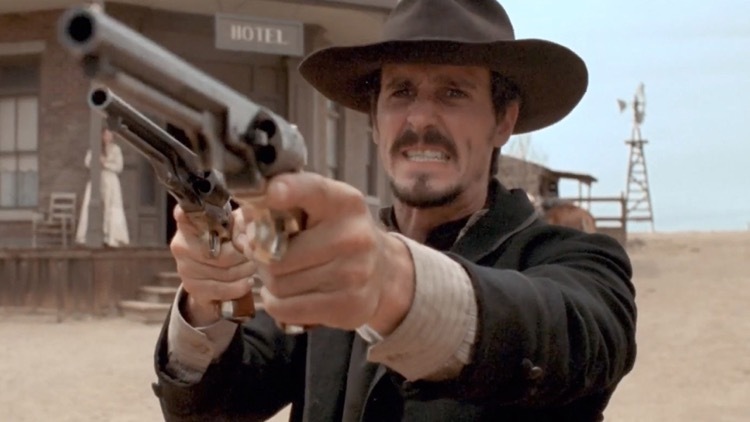 There’s a lot of great content in West’s script and though the film is a bit of a slow burn at times, the second half of the film churns out plenty of fun sequences that contain a bit of everything. Larry Fessenden’s, Roy, makes an impression with his limited screen time and James Ransone, who I’ve been a fan of ever since Larry Clark’s art house film, “Ken Park”, turns in a slightly uneven performance but his good is quite good. A lot of work clearly went into the costume design and recreating the period authentically. Not only that, but even the set dressings, which may be scarce in volume (mostly due to budget I imagine) but not quality, help to create the world for this tale of revenge to take place in. Most of the action gets underway toward the end of the second and third acts but the gun slinging is a good bit of fun. There’s some brief practical blood on display as well. As with each of Ti’s films (maybe minus Cabin Fever 2), the technical aspects are all very polished, so no complaints on that front. I loved ninety percent of the music but the film is occasionally a touch to melodramatic as far as the score goes. Especially when you consider there’s a connotation that this isn’t as serious of a film as you might think, so those over dramatic cues don’t always work. As I previously stated, I enjoyed parts of Ransone’s performance but the character overall was just a pest and someone who Paul wouldn’t have any trouble dealing with in real life. I understand that Gilly was written that way but it’s far more impactful if you’ve got that callous, larger than life leader and he was anything but that. There’s a slight lack of attention to detail in Hawke’s makeup as the film wears on. One sequence essentially sees him take a fall and be left for dead, yet when he surfaces again, he barely appears to have a scratch on him. It’s quite a common problem, especially in Action films where the hero takes a brutal beating but never seems to exhibit the full after effects of that beating. A couple of scenes throughout the film weren’t that important to the direction of the story either, namely a discussion of pregnancy between Gilly and Ellen at an inopportune time. That scene just felt like unnecessary comedic relief. Another night scene features a brief flashback to Paul’s army days but it doesn’t highlight any real significance to him and his dog, or the root of the battle with his conscience. The only letdown with In A Valley Of Violence is some of its predictable revelations but most films have certain events you can see coming in advance. 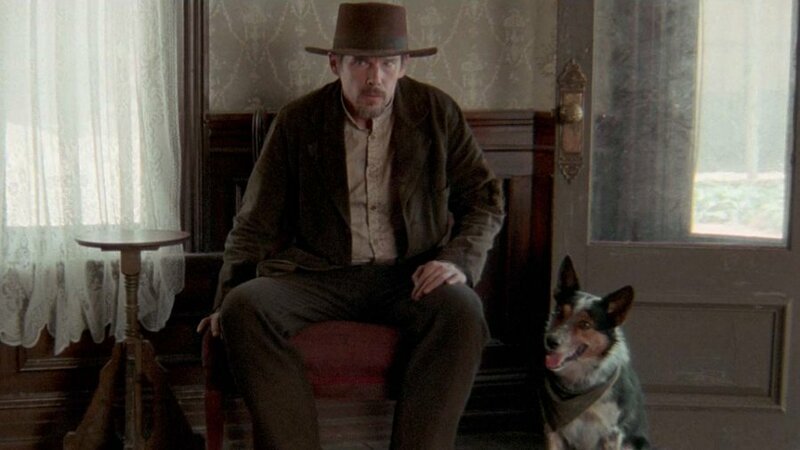 In A Valley Of Violence is Ti West stepping out of his comfort zone and delving deep into the world of the wild west and doing a damn fine job of it I must say. I’d heard whispers about the film and most of them were positive but it far surpassed my expectations. The cinematography is impressive and the film is color graded appropriately for the genre and its period. I dug the interesting opening credits and a majority of the films score, particularly the memorable theme. The costume design and set decoration looks good and the inclusion of John Travolta and Ethan Hawke, only raise the films stocks. I liked that Travolta not only played and entirely different character from anything he’s ever done before but also that Ti strayed from the path most often taken, in giving Travolta something different to work with altogether. There’s a lot of great dialogue driven scenes and the bond between Paul and his dog will be something most viewers can connect with. I didn’t fully feel Ransone’s character and some of the attention to detail wasn’t perfect. A couple of sequences could have been cut but as it stands, the film runs the perfect length at just over 100 minutes. In A Valley Of Violence is somewhat predictable but it doesn’t take much away from the overall enjoyment. In my opinion it outshone last years “Bone Tomahawk” ) and is one of the best modern westerns I’ve seen since, “310 to Yuma”. West with another winner!